My friend Count Prince Miller who died in 2018, would have been 85 years on the 30th of March this year. Sadly he passed away on the 16th of August 2018. 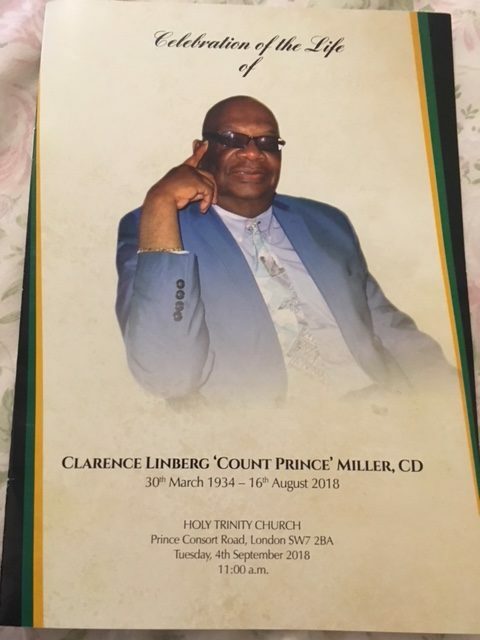 A memorial service was held on September 4th 2018 at the Holy Trinity Church, Kensington, next to the offices of the Jamaican High Commission in London. A proud Jamaican, he would have wanted it that way. The Jamaica High Commissioner to the UK, His Excellency Mr. Seth George Ramocan had organised a quasi- state event that drew many to the august sending off. The Reverend Rose Hudson-Wilkin delivered the sermon. Fittingly, his close friends Jimmy James, George Ruddock, his agent Reima Baker, Beverly Lindsey, Orman, Winston Francis, Basil Barnaby were all in attendance. Over the years, this charming unassuming man had created families wherever he worked. From the cast of ‘Black Heroes in the Hall of Fame’ to ‘JA Story,’ to the actors of that famous IKEA Christmas TV advert, all were there to pay their respect. After the service, a reception was held at the Jamaican High Commissioner’s Office. There in the yard, we were entertained by many of his fellow friends and artists. 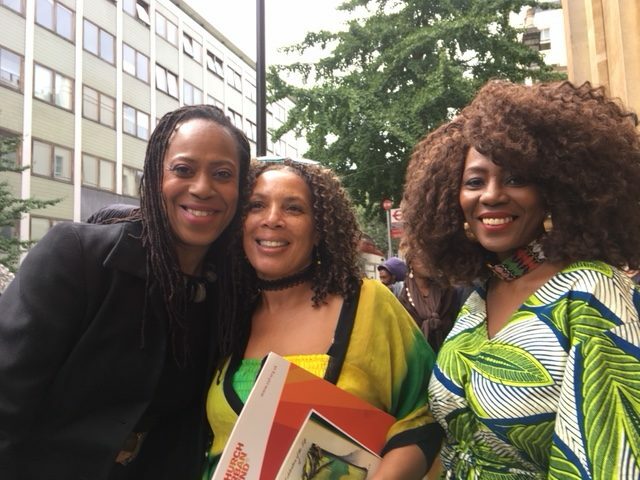 Wearing the colours of Jamaica- (left to right) Paulette, Sharon and Ingrid from the cast of Black Heroes pose outside Holy Trinity Church, Kensington. We all admired, his ability to make friends, his ability to make people want to be his friend and his capacity to maintain long friendships. Case in point, he befriended the location manager of Dr. No, in Jamaica in 1962, Chris Blackwell. That friendship lasted to his death. A 56 year old friendship. A true, all embracing bond of comrades. He arrived in England with Jimmy James and the Vagabonds in the early 60s. London at the time was the heart of world popular culture, ideas, dress, music and fashion. The Beatles and the Stones, had introduced British audiences to the music of Motown, Stax, Atlantic and British audiences were now attending shows by Black performers. Jimmy James and his Vagabonds were pioneers on this front. He was always immaculately dresses. He liked his clothes. I remember going backstage, I could not take my eyes off his stylish grey suit. I complimented him. And took my seat. Then half an hour later he bounced on stage with a different suit twice as nice, with matching suit and tie. Yes he always accessorised. He was an actor of immense talent, an entertainer of limitless ability, an all-round good Uncle to all and a dear father to his son Pierre. Yes he has been missed.